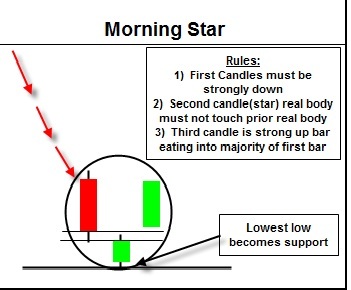 The morning star is a bottom reversal pattern. Its name is derived because, like the morning star (the planet Mercury) that foretells the sunrise, it presages higher prices. It is comprised of a tall, red real body followed by a small green body which gaps lower (these two lines comprise a basic star pattern). The third day is a green real body that moves well within the first period's black real body. This pattern is a signal that the bulls have seized control. I will break down this three candlestick pattern into its components in order to understand the rationale behind this last statement. The market is in a downtrend when we see a red real body. At this time the bears are in command. Then a small real body appears. 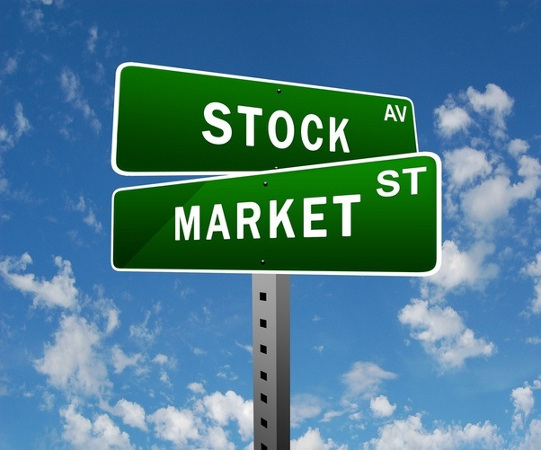 This means sellers are losing the capacity to drive the market lower. The next day, the strong green real body proves that the bulls have taken over. An ideal morning star would have a gap before and after the middle line's real body (that is, the star). This second gap is rare, but lack of it does not seem to vitiate the power of this formation. The evening star is the bearish counterpart of the morning star pattern. It is aptly named because the evening star (the planet Venus) appears just before darkness sets in. 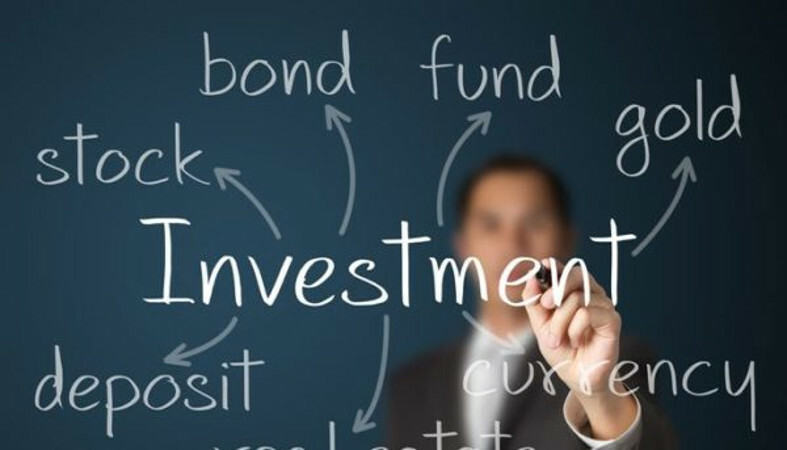 Since the evening star is a top reversal it should be acted on if it arises after an uptrend. Three lines compose the evening star . The first two lines are a long, green real body followed by a star. the prior trend has stopped). into the first day's green real body. 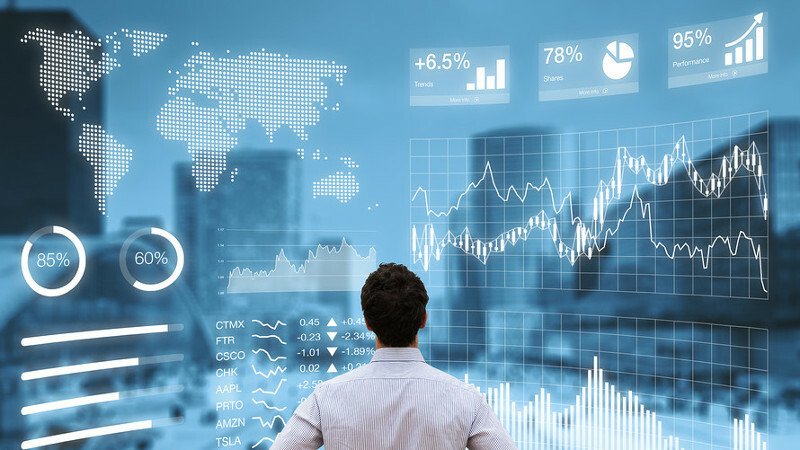 When a doji gaps above a real body in a rising market, or gaps under a real body in a falling market, that doji is called a doji star. shows doji stars. Doji stars are a potent warning that the prior trend is apt to change. The session after the doji should confirm the trend reversal. Accordingly, a doji star in an uptrend followed by a long, red real body that closed well into the green real body would confirm a top reversal. Such a pattern is called an evening doji star. The evening doji star is a distinctive form of the regular evening star. The regular evening star pattern has a small real body as its star (that is, the second candlestick), but the evening doji star has a doji as its star. The evening doji star is more important because it contains a doji. A doji star during an uptrend is often the sign of an impending top. It is important to note that if the session after the doji star is a green candlestick which gaps higher, the bearish nature of the doji star is negated. 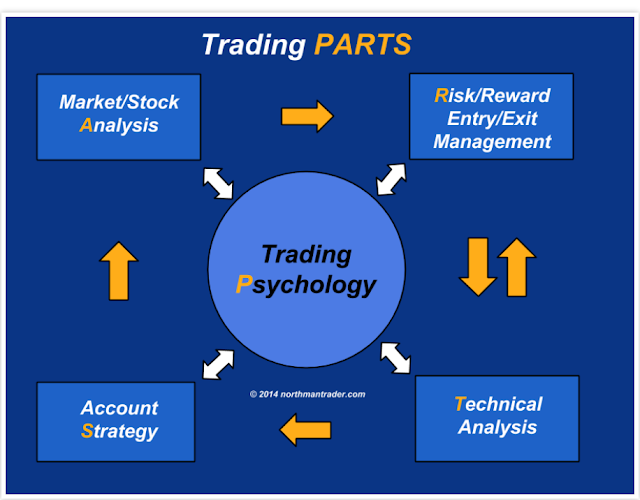 strong, green candlestick which closed well into the red real body. 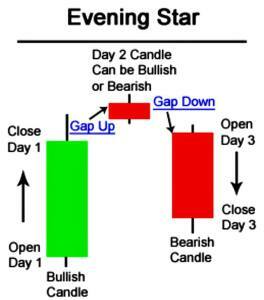 That three candlestick pattern is called a morning doji star .This type of morning star can be a meaningful bottom. If, during a downtrend, a black candlestick gaps under the doji star, the potentially bullish implications of the doji star is voided. This is why it is important to wait for confirmation in the next session or two with doji stars. session would be a doji.